147 Frank Roper CLUETT was aged 21, a marine blacksmith by trade from Abbotsford Sydney. He was the son of Ernest and Ida (nee Geetson) He enlisted early and joined the engineers while his brother, 703 Ernest Randolph Cluett volunteered a few months later and was placed with the 1st Light Horse regiment. His younger brother Cecil would join much later in June 1918. Frank was a dawn lander on the 25th April and within a few days was very likely sniped and severely wounded, shot in the spine on the 30th April 1915. The following article published in The Sydney Morning Herald on Monday 10 May 1915, reports Frank’s wounding at Gallipoli and also some additional family background. Frank Cluett was dangerously ill for a considerable time and as soon as his condition had improved he subsequently returned to Australia….. Frank would spend the rest of his days in a wheel chair. Frank also had to live with the loss of his older brother Ernest who was killed at Lone Pine, at “Popes Hill” Gallipoli on the 7th August. The following news article was printed in the Sydney Morning Herald on Friday 24 September 1915……..It describes the fate of both Frank and Ernest. 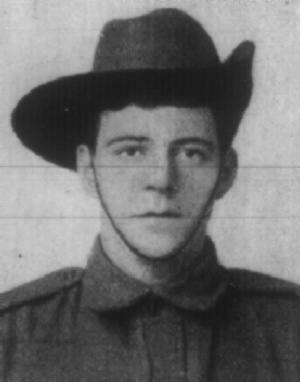 Although sure to be physically and emotional scared by his wounds and the loss of his brother, it did not prevent Frank from living a full life on his return to Australia. Frank had faced the dangers of Gallipoli and was determined to enjoy life even it meant from a wheel chair, his spirit and determination would not be broken and he would continue to share that passion for life with fellow soldiers suffering from disabilities. Frank and his friend John O’ Connor had loomed up behind a horse and cart and swerved, however hit the horse and their cycle and side car overturned injuring both men. They were both taken by ambulance to Manly Cottage hospital. Frank and his blind friend Frank Morris shared a lot of time fishing and boating around Sydney Harbour and must have met with admiration and equally with concern due to their combined disabilities, but found enormous support from the prestigious boating communities of Sydney Harbour and also the Governor of NSW. Article published The Sydney Morning Herald Thursday 15 September 1927. “Two disabled returned soldiers, Messrs Frank Cluett and Frank Morris, of Balmoral, will be presented with a modern motor boat at the clubhouse of the Royal Motor Yacht Club of New South Wales, Wunulla-road, Rose Bay, on Saturday afternoon. His Excellency the Governor, Sir Dudley de Chair, has been requested to make the presentation on behalf of the yachtsmen of Sydney. 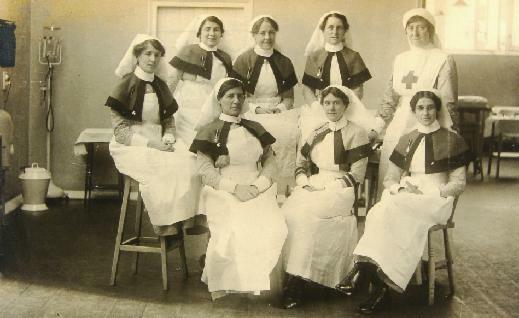 At some point from his days of repatriation in hospital, it is very likely that Frank crossed paths with Miss Mabel Rosemary Boniface, a distinguished and highly qualified nursing sister. Her own story made headlines in February 1919. In 1920 Frank later married Mabel, a fortunate partnership of two very selfless people. Together they established their own home at 41 The Esplanade, Balmoral Beach, Mosman, and made it available as a Convalescent home known as “Sunnyside” for returned serviceman, who were either still recovering physically and emotionally from the war or recovering from a recent operation. Mabel particularly had dedicated her life to the care and well being of service man and with Frank’s personal experiences and kinship to other ex serviceman , they made a formidable partnership. Frank’s love of the outdoors particularly the sea and fishing saw Mabel and himself spend holidays at Forster NSW , a destination fast becoming popular among Sydneysiders and noted for it’s particularly good fishing and relaxed coastal lifestyle. “Hand carved and finished wooden trick puzzle featuring a wooden arrow slotting into a wooden plywood square. The square is marked in black ink ‘Guezirah [sic] Palace Presented to Pte Cluett’. 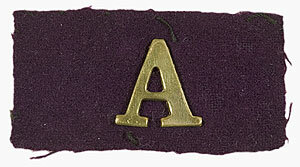 It is also marked in a different hand ‘In Memory of the Great War 1914 – (illegible)’. Associated with 147 Sapper Frank Roper Cluett, a 21 year old blacksmith from Sydney, who enlisted in the AIF on 20 August 1914 and was assigned to 1 Field Company Engineers. He left Australia aboard the transport HMAT Afric on 8 October and trained in Egypt until his unit was sent to Gallipoli in 1915. 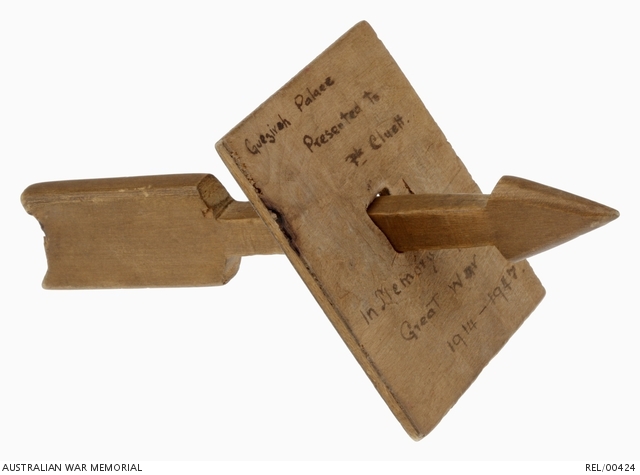 Cluett received a gunshot wound to his back on 3 May 1915 while serving on Gallipoli. Evacuated to 2 Australian General Hospital (AGH) at Gezira in Egypt, Cluett was listed as dangerously ill at the end of August. In October he was assessed as ‘still seriously ill’, suffering from myelitis, an inflammation of the spinal cord. Frank died a relatively young man at 46 years of age but friendships and charitable support to other veterans despite his own circumstances are testimony to him as being not only a great ANZAC but as Mr S.W described as “a fine example of humanity “. Franks Death Notice inserted in the SMH on Wednesday 31 January 1940. 1. Photos available of Frank Cluett and family, however awaiting contact. 2. Wounding date from AWM should be 30th April, he was hospitalised Egypt on 3rd May as per war service record. CLUETT, Mabel Rosemary – May 3, 1974 at her residence, Cardinal Street, Mosman, dearly beloved wife of the late Frank Cluett, loved sister of Sidney Boniface and dear aunt of Robert and John Boniface. May she rest in peace. FUNERALS CLUETT – Requiem Mass for the repose of the soul of the late MABEL ROSEMARY CLUETT, of Cardinal Street, Mosman, will be celebrated at the Sacred Heart Church, Cardinal Street, Mosman, on Monday May 6, at 10 am. The funeral will leave the church after Mass for the Catholic Cemetery Northern Suburbs.